Since 2006, hundreds of female students have visited MITRE to learn about engineering during "Young Women in Engineering Day." It's an opportunity for students to soak up the collective wisdom of highly accomplished women engineers at MITRE who talk to them about their work both individually and in groups. The agenda always includes a keynote presentation, panel discussions, workshops, demonstrations, and a group mentoring session. "I didn't know there were so many different kinds of engineers, that you could move around between fields, and that engineers from the different fields collaborate so closely," said one recent participant. Designed to help close the gender gap in the enrollment of pre-engineering and information technology courses, the day-long event strives to introduce middle and high school girls to engineering careers. 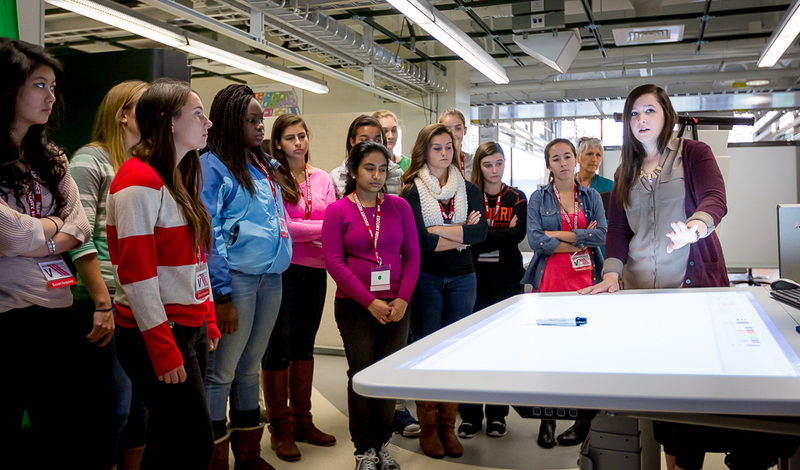 "Visiting MITRE helped me gain insight into what engineers do," said one teenage girl. For many of the girls who attend the event, it's an experience that opens up new possibilities they perhaps hadn’t even considered. "I was feeling really lost about an engineering path, but the MITRE women told us it’s okay not to know yet," said one student. "In fact, they said it's a good idea to explore for a while, which is really reassuring."